Recent release “The Koala and the Crocodile” from Page Publishing author Tea Bird is the story of a koala bear’s love of eucalyptus leaves, his desire to belong, and the important lessons he learns along the way. Tea Bird is a mother of two and a passionate creator of stories for the young. She is currently presenting her new book “The Koala and the Crocodile”, the story of a koala’s love of eucalyptus leaves, and the colorful relationships that spark his personal growth. “Good manners, kindness and the acceptance of others are important lessons to learn and practice with everyone we meet”. Published by New York City-based Page Publishing, Tea bird’s delightful tale of a koala’s encounters with others in the animal kingdom is both humorous and unforgettable. 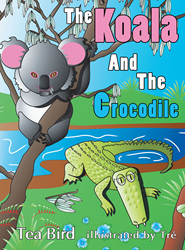 “The Koala and the Crocodile” is a fun and endearing story that encourages good manners, kindness, and safety. Koala’s interactions with the spirited characters of the animal kingdom places emphasis on family values, friendship, acceptance, and when to trust others. Readers who wish to experience this delightful work can purchase “The Koala and the Crocodile” at bookstores everywhere, or online at the Apple iTunes store, Amazon, Google Play or Barnes and Noble.